Former U.S. Rep. Ruben Hinojosa spent 20 years focusing on educational needs in the Rio Grande Valley. 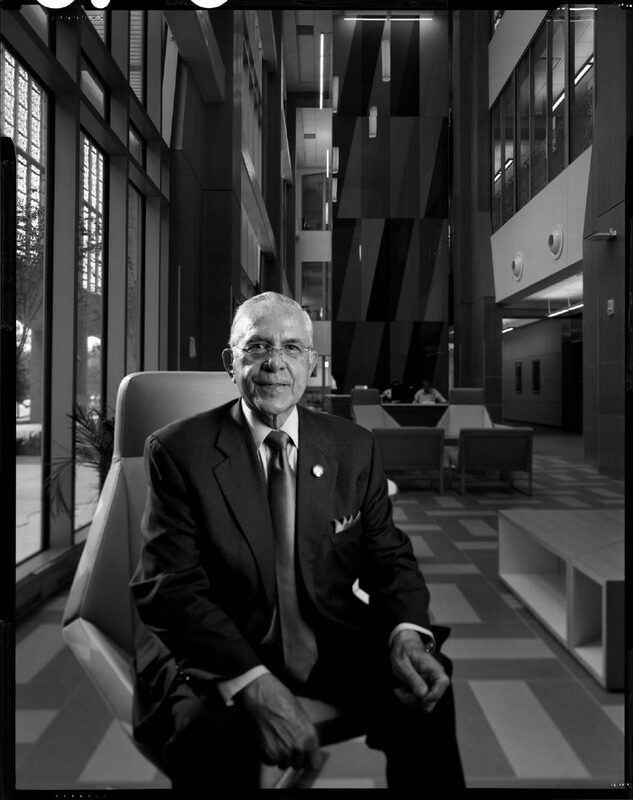 Sixteen years ago Hinojosa co-founded HESTEC, a week of educational focus on hispanics in engineering, science and technology. This year HESTEC adds a new medical and energy component to the lineup of educational programs for students and teachers. When Rubén Hinojosa was a junior at Mercedes High School, he narrowly won his first election by a single vote — setting a theme for 19 more thereafter. In fact, the former congressman has never suffered an election loss, and if you count his junior year win at the Boys State educational program, he’s been elected a total of 20 times. While Hinojosa has never experienced an election loss in his lifetime, he still had hurdles to clear. Pointing to an early 1940s photograph of him standing atop a wooden chair, Hinojosa recalled traveling by train to Galveston where he underwent a treatment to help him stand up straight, as he was born bowlegged. Though it posed some challenges while playing sports, Hinojosa still played on four championship football teams. Skilled in math — his best subject — and determined, Hinojosa eventually caught up to his peers. “In the fifth grade, when we came to Mercedes, was the first time I was in classes with English-speaking students,” Hinojosa said. Spanish was his first language, and it wasn’t until eighth grade that he was able to master English. Hinojosa, the son of Mexican immigrants, graduated high school at the age of 17 before attending the University of Texas at Austin, graduating with a Bachelor of Business Administration at the age of 21 prior to earning a Master of Business Administration in two-and-a-half years. After college, Hinojosa ran his family’s food processing corporation, the Mercedes-based H&H Foods. From the Mercedes school board to the U.S. House of Representatives, the lifelong Democrat has persisted in broadening educational opportunities for the constituents he served. The father of five college graduates has been married to Martha “Marty” Hinojosa, an architect, for 27 years. “Now, she’s working on the basketball arena, that will be the Bert Ogden (Arena),” Hinojosa said. His morning routine hasn’t changed much since his retirement in January 2017. He still wakes up at 6 a.m. and continues his daily routine of reading newspapers — The Monitor in print and the New York Times, the Washington Post and the Dallas Morning News on digital. “I have a great deal of interest in being able to have intelligent conversations with people that I run into and that I visit,” he said. Through the years, Hinojosa, who served on the education and financial services committees in congress, has often written down detailed goals and advises others to do the same. “If they write a plan … you have a 90 percent chance of accomplishing that goal,” he said. Throughout the month of August, Hinojosa has spent time developing a written plan for HESTEC — Hispanic Engineering, Science and Technology Week — which he founded alongside University of Texas-Pan American’s then-president Miguel Nevárez. Now in its 16th year, HESTEC will be held at the University of Texas Rio Grande Valley beginning Oct. 1. “HESTEC has had a tremendous student enrollment in these fields,” Hinojosa said. HESTEC has evolved over the years. In 2018, the first Greenpower USA Electric Car Challenge will allow students to compete by constructing an electric race car. This month, Hinojosa was named special assistant to the president at UTRGV, and plans to spend time working on special projects. Hinojosa occasionally travels to speak, most recently he was featured at the Hyphen Solutions conference for homebuilders and suppliers held on Sept. 11 in Dallas. In Congress, Hinojosa helped in the effort to establish the Anzalduas International Bridge and the Donna-Rio Bravo International Bridge, Interstate 69, and $300 million worth of repairs of the levee system, what he considers some of his biggest accomplishments. His goal was to bring down the unemployment rate from 22 percent in Hidalgo County and 27 percent in Starr County. Ten years later, he said, the unemployment decreased to a single digit. “Naysayers said that would never happen because we were so poor,” Hinojosa said.